Riddle me this: what do game companies do when competitors release extremely popular titles? Let's ask Professor Layton, star of huge-in-Japan puzzle games. He's busy. Will Doctor Lautrec do? Doctor Lautrec is the star of Konami's upcoming cartoon-style Nintendo 3DS game, Doctor Lautrec and the Knights of Oblivion. While he goes around and solves mysteries and talks to people, it has nothing to do with the popular Professor Layton games. It's completely different. See, Doctor Lautrec is not a professor of archaeology, but a doctor of archaeology. What's more, he doesn't have a brown-haired sidekick named "Luke", Lautrec has a blond young female named Sophie. Doctor Lautrec isn't British like Layton, he's French. 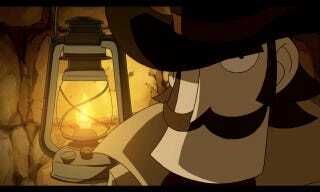 Lautrec also has a big moustache; Layton does not. See? Different. And while Professor Layton wears a top hat, Doctor Lautrec also wears a top hat. Professor Layton Doctor Lautrec and the Knights of Oblivion is scheduled to be released on the Nintendo 3DS next spring in Japan.